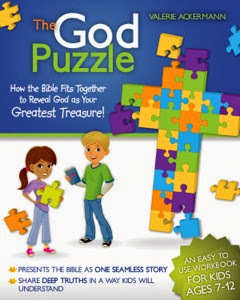 The God Puzzle: How the Bible Fits Together to Reveal God as Your Greatest Treasure for 7-12 year olds and their parents is a colorful, easy to use tool to help you communicate to your child the rich truths about God, His ways, His will and His love. The God Puzzle will help you address doctrinal themes of the Christian faith in a kid friendly way, present Bible lessons in an interactive way that will hold the child’s attention and deliver quality teaching with no preparation needed. 75% of children leave the church when they leave home. Something isn’t working. Sunday School isn’t doing it all. Kids need answers, good ones. And they need them from you, the parent. This book enables you to give them simple, clear answers. You can get more information about this great product and order it at www.leadmetogod.com. We will be giving away 2 free copies to our readers. You can enter the drawing by emailing dalehudsoncm2@gmail.com. We will announce the winner right here next Monday.